I'll be the first person to admit that I don't really enjoy Jose on Bermondsey Street. It's nothing personal, it's just that I don't enjoy tapas restaurants in general. The thought of being crammed into a small space with a host of other people, where the noise is deafening and I am forced to eat standing up. Sadly, the old curmudgeon in me can think of nothing worse. 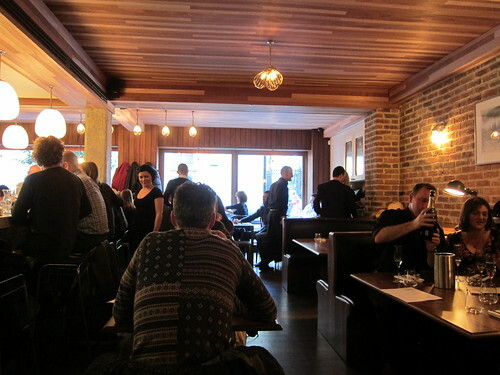 Having said that, I enjoyed all the food at Jose and when I heard that Pizarro, a sit down version of Jose, was due to open, I was pretty excited. I could finally "enjoy" my food. And open it did and with a 4 day soft opening period announced (offering 50% off), this was an offer not to be missed. Pizarro is a lovely restaurant. 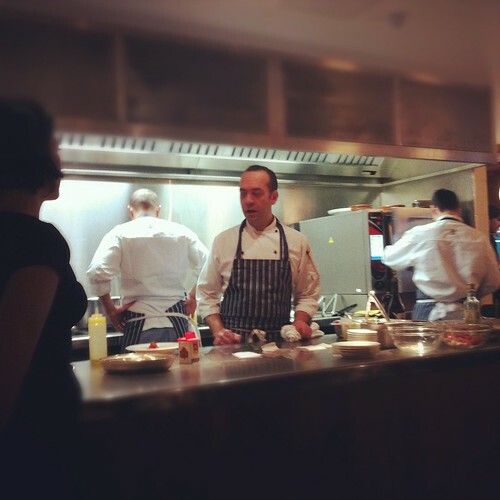 The kitchen is open, much like Jose and many tapas restaurants so you can see the chefs beavering away and there are plenty of seats at the bar to drink sherry and watch the chefs cook your food. The menu is much more conventional with the first section split into more "tapas" size dishes which you can adopt as a starter or order a few to share around. The ham croquettas are as good as up the road (unsurprisingly) but it was the other dishes we ordered that surprised me. 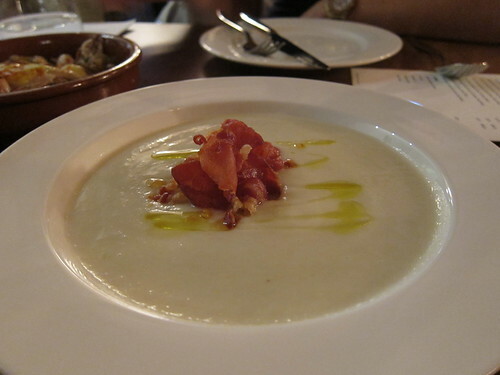 Jerusalem artichoke soup with a dash of truffle oil and little garnish of crisp ham is finely balanced and moreish. Sweet, salty and rich from a whiff of truffle. 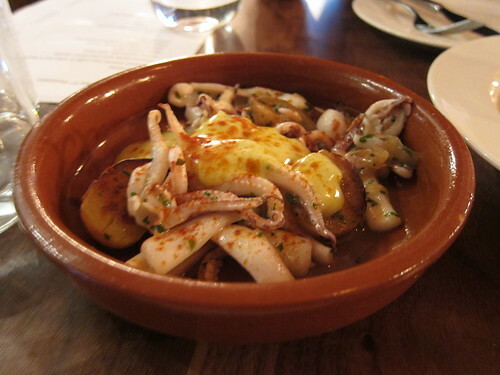 The other starter of squid, potatoes and allioli was simple, but mostly simply delicious. Delicious strands of squid perfectly cooked and coated in a subtle allioli. I would liked a shade more potatoes but merely whimsy as opposed to a criticism. No matter how good those dishes were, the mains were properly stand out. As much as I would normally shirk away from ordering fish from any menu, hake is a fish I quite enjoy. Solid flesh, good texture when cooked right, pair it with some black cabbage and some clams and you have a dish that just cries out "Order me!". So order it I did. 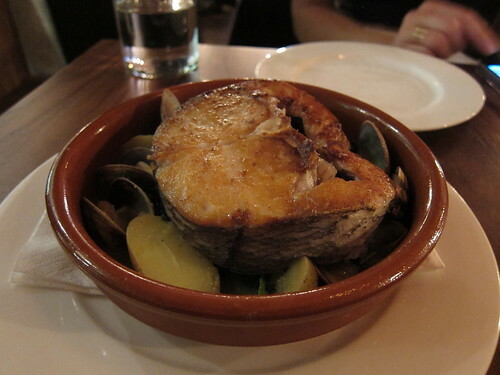 The hugs slab of hake filet was perfectly cooked with a crisp exterior and meltingly soft in the middle. The dish tasted like the sea in the best possible away. 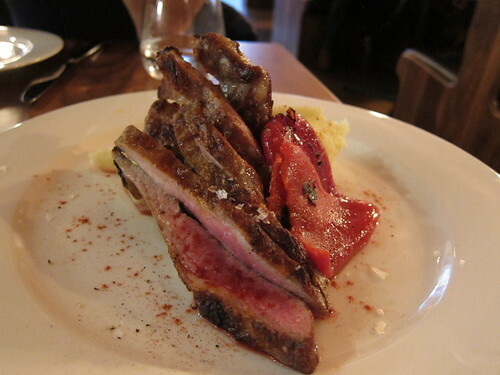 However, the Secreto Iberico with piquillo peppers and olive oil mash was on another level. Imagine a generous portion of perfectly executed iberico, still slightly pink in the middle, and a slightly caramelised layer of fat, with a smear of slightly grassy olive oil mash and just when you thought it was slightly too savoury, the zing of sweet pepper. This was up there with the best thing I have eaten this year. Whatever you do, make sure there is space for some dessert. 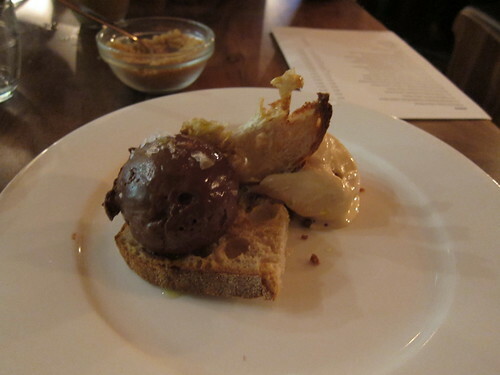 Alongside a spiced clementine rice pudding which felt like Christmas had come early, was an odd ensemble of toast, chocolate gan-ousse (somewhere between a ganache and a mousse) and a ball of caramel ice cream. With a sprinkle of salt and a drizzle of olive oil, this strange mash up of ingredients felt like heaven on the tongue. Pizarro was only 3 days old when I visited and if the food continues to be produced to this standard, it will inevitably be the first visit of many. I only had one tiny quibble. Whilst the service was warm and friendly, I struggled to communicate with our waitress (who I believe was Spanish) on multiple occasions and ended up doing a lot of pointing when ordering, and getting general blanks when asked if they served tea. Still, just minor quibbles, Pizarro is going to be a triumph whichever way you look at it, and I can't wait to go back. That Secreta Iberico looks incredible!! I think we'll have to make a trip to Bermondsey for this, it looks incredible. Oh god, spanish food.... this kills me. This might even inspire a trip to Spain. Glad to see London is still rocking it. Just one thing..I always read about 'soft day openings' and these 'special 50% off' stuff. Could you point me in the right direction to actually be informed of this? I'm guessing it can't exactly be a trade secret thing (cause afterall restaurants are duh open for the public) but I'm guessing there's more than just word of mouth? Anyways please help if you can! @ Chloe - It is. @ Phil - Well worth a visit. There is plenty happening on Bermondsey street, well worth checking out. @ Sis - Yes it was. @ Tom - You should never have left. I think the restaurant scene is only just getting started. @ Anon - Sadly that is where I get most of the info from, although you can read Hot Dinners (http://www.hot-dinners.com/) who are normally on the pulse of the London restaurant scene. PS Can I just give love to my word verification today --- foove!